It was 17 years ago when Alabama was last crowned national champions. 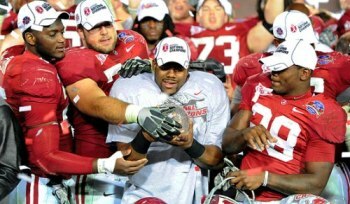 The Tide beat Florida in the inaugural SEC Championship Game and then beat Miami in the Sugar Bowl for the crown. I was 14 years old and watched that game in my grandmother's living room. In 2009, I was 31 and I was actually there when my Crimson Tide beat the Texas Longhorns in a truly bizarre football game. Here's my recap of a season filled with history and broken records, and why I think this was the greatest season in Alabama football history. Born December 21, 1978, in Newton, Alabama. Chad is the elder child of Edward and Myra Woodard. He has one younger sister. He grew up in Newton, Alabama, where he attended Newton Elementary School, South Dale Jr. High School, and Dale County High School. Chad played baseball well into high school and excelled in mathematics. In his junior year of high school, Chad attended Alabama Governor's School where he met lifelong friends Josh & Elizabeth Hood and Ashanti Roach. After graduating as valedictorian from high school, Chad accepted scholarships to the University of Alabama and belonged to the Mallet Assembly Men's Honors Program. There he was reunited with his Governor's School friends and began studying aerospace engineering. In his junior year he switched his course of study to mechanical engineering. It was also at Alabama where he was formally introduced to ultimate frisbee and friend David Potter. In 2001, he was the first and only player to date from the University of Alabama to be nominated for the Callahan Award, given to the top male and female college ultimate players in the country. In 2002, he graduated from Alabama with a bachelor's degree in Mechanical Engineering and accepted an engineering position with the United States Air Force at Robins Air Force Base in Warner Robins, Georgia. In June of 2002, Chad moved to Byron, Georgia and began work in the Support Equipment and Vehicles Directorate. After completing the engineering training program he became the Senior Engineer for the Basic Expeditionary Airfield Resources (BEAR) Program - also known as the Air Force's "Tent City." In December of 2005, Chad finished his Masters degree in Public Administration from Georgia College and State University. Immediately after finishing his coursework, he moved to Lancaster, CA, where he worked as a flight test engineer at the historic Edwards Air Force Base. There he was responsible for the tests of a wide range of equipment including everything from chemical detectors to personnel parachute subsystems. July 26, 2008 he married his wife Sarah, who he met through ultimate frisbee. Chad fell in love with Sarah at first sight during an ultimate frisbee game but could work up only enough courage to compliment her socks. Sarah simply said "thanks" and wandered off to her friends. Their paths would cross occasionally on the ultimate field, but always on different teams. They would formally meet almost two years after the sock compliment through their mutual friend Dayna. They finally got to be on the same team in the fall of 2007 and have been inseparable ever since. Chad has helped to organize and participate in ultimate frisbee clubs wherever he has lived. He currently plays with various teams with the Los Angeles Organization of Ultimate Teams (LAOUT) organization in Los Angeles, CA. Chad now works for the defense contractor Raytheon in El Segundo, CA. He and his wife live in beautiful Manhattan Beach, CA. Here you can see my gear, pictures of past trips, and links to other cool snowboarding stuff. Hopefully this winter produces a lot of material for this page. The home page of 59 Minutes Early Fantasy Football. A work in progress, but features weekly performance as well as career stats (and hopefully cool things like coach bios one day). As promised in 2002 by Thah Hpay, the God’s Army homepage has been restored to its original glory. All the members of the Jesus Commandos Chapter can relish in their embarrassing binge drinking episodes feats. The grass ulty season is year round. Pictures of our Winter League team and the St Pat’s Hat Champs! Pictures of me and Sarah playing ultimate on the beaches of Southern California. 2009 Beach League Champs ShamWow! Hundreds exercised their constitutional right to gather publicly and protest against global warming. Ever get asked, "What is the worst movie you ever saw?" I finally have my answer. Home Alone 4 goes beyond bad. Here is my review, and why is should have never been made in the first place. I took my Xbox 360 apart and even put it back together again. The best part is that it even plays video games now. Here is the full report. The look is new, but you can still find all the old crap here.